June, 17th marked the arrival of the Mandela Washington Fellows at Ohio State. The 25 young African leaders from 17 countries were on campus for six weeks this summer where they sharpened their skills through academic coursework, leadership training and networking. 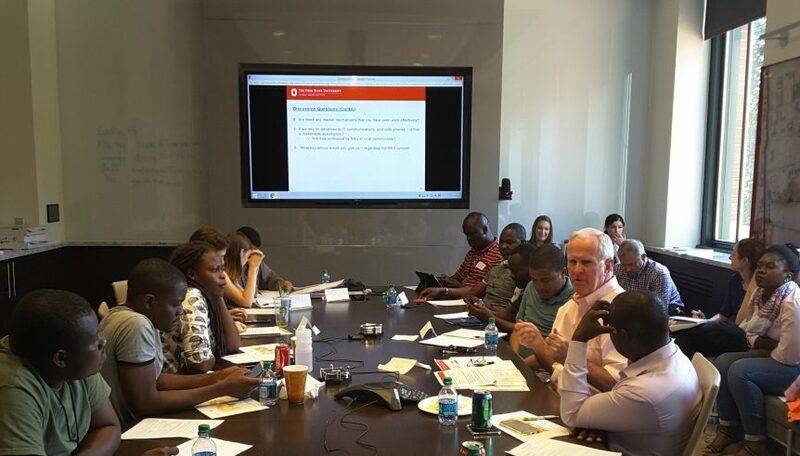 The Global Water Institute (GWI) took advantage of the unique opportunity of having top-notch young African leaders on campus by hosting an ideation session to gain their insight on our Water, Energy, Education and Economic Development Project (WE3) in Tanzania. The session yielded lively discussions and thoughtful input on our systems approach for rural village water systems in Tanzania. The systems approach to development was a theme emphasized by most of the Fellows during their Ignite talk held on July 27th. Kine Fatou Faye, Agronomic Engineer from Senegal asked, “It is surprising to note that when implementing agricultural related projects, nobody talks about the need for energy, but how do you expect farmers to process or preserve their produce if they do not have access to energy? And when implementing water projects nobody talks about agriculture or energy, but how do you expect the people to pump water in a place where they do not have access to power from the grid if they are not helped to tap energy sources such as solar, which is abundant in Africa?” The majority of the presentations emphasized the need for collaboration and coordination among experts from various fields as well as the importance of adopting the systems approach to project implementation for sustainable development. GWI commends the Fellows for all their hard work and wishes them well as they return to their home countries. The future of Africa is bright with these young leaders ready to take the helm. The fellows were co-hosted at Ohio State by the Glen College of Public Affairs and the Center of African Studies.